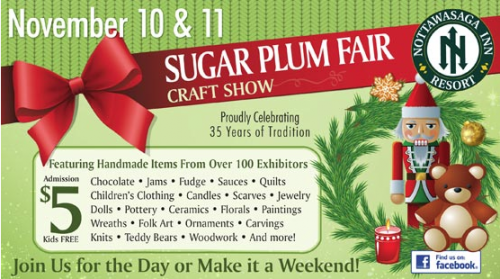 The highly anticipated 35th Annual Sugar Plum Fair is taking place on Saturday, November 10, 2018 (9am-5pm) and Sunday, November 11, 2018 (10am-4pm)! Whether you’re a return or first time visitor you will experience a treat at this year’s show. We’re excited to welcome back some incredible vendors and introduce a line-up of new and talented crafters and artisans who will be displaying their creations during the two day show. The show features over 120 vendors from across Ontario selling a variety of items including chocolate, jam, fudge, sauces, quilts, candles, ceramics, stained glass, wreaths, folk art, woodwork, sewing, knitting, body care products and more! Santa will also be stopping by for a visit. Once again this year we will be raffling off gingerbread houses, which have been decorated by the resort staff, in support of a local charity. Show Dates: Saturday, November 10, 2018 - 9am to 5pm Sunday, November 11, 2018 - 10am to 4pm Admission: Adults - $5 per person Children - 12 and under are free Visitor Tips: The mornings can be quite busy at the Sugar Plum Fair. Crowds tend to be smaller in the afternoon after 1pm or 2pm. Please consider leaving any strollers in the car or at home and using a baby carrier if you are bringing your child with you. We love having the whole family visit, but when the floor is busy it's not particularly stroller friendly. Venue: Nottawasaga Resort 6015 Highway 89, Alliston, ON For a full list of vendors participating in the show this year please visit our website.